Fans of the solo piano disc, “Cold-Hearted Orb,” will likely find much to enjoy in “Winter Canvas.” MacNaughton writes from the heart. CD Baby is the best! Michigan is a beautiful state! The songs were inspired by and pay tribute to Michigan's natural wonders. Great players all...hope you enjoy. 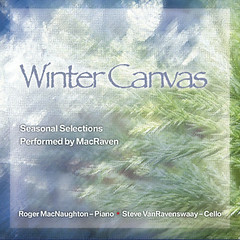 Emotion runs deep in the second MacRaven release, “The Heart Does Not Forget.” Roger MacNaughton (piano) and Steve VanRavenswaay (cello) present instrumental gems sure to transport the listener to another world. …Places in the soul that reflect our moods and passions. …Places where we escape harshness – replenish energy. Eleven solo piano compositions bring peace and clarity to a cluttered world. 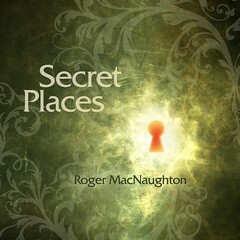 Melodic, romantic, serene, haunting, and passionate… Take your own journey to uncluttered Secret Places. Describing music’s effects, Jan Sheehan notes in November 2005 Family Circle Magazine, “Perhaps nothing makes us feel crazed as quickly as noise pollution. 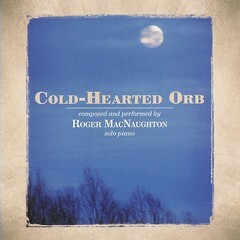 Listening to music can lower pulse, blood pressure and muscle tension.” With “Cold-Hearted Orb,” Roger MacNaughton invites the listener to relax to piano solos crafted in soothing hues and performed with sensitive artistry. Inspired by life, these 14 pieces add a soundtrack to the mind’s pictures. Jazz meets Blues meets Contemporary. 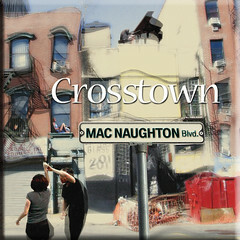 This CD of all-original tunes takes full advantage of first-rate ensemble playing by the popular quartet “MacNaughton Boulevard.” On fretless bass, Charlie Hoats is proud to have played or recorded with the likes of Marcus Roberts and Michael Brecker. Steve Anzivino adds rhythmic support with drum-set prowess and hand percussion techniques and Carlos Melendez speaks fluent “guitar” having performed around the globe with Jose Feliciano, Sonny Fortune, Herbie Mann, The Drifters, David Sanchez, Eddie Gomez, and Artie Webb. Award-winning composer, Roger MacNaughton, rounds out the group on piano. Inspired by “Degage – a shelter providing a safe alternative to the streets,” the 12 instrumentals reflect a bluesy “urban” twist to the MacNaughton new-age, contemporary piano style.